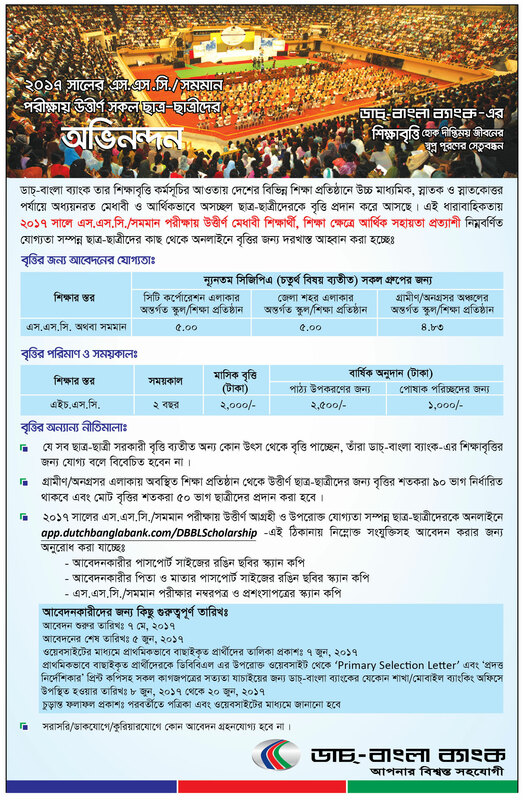 Dutch Bangla Bank Scholarship SSC Result 2019 will be published toady. DBBL has announced the circular today’s afternoon. Students who passed SSC in 2019 with very good result they can apply for the Dutch Bangla Bank Scholarship SSC Result 2019. Application for the scholarship will be started on 7th May 2019. The result will be published on 7th June. Dutch Bangla Bank SSC Scholarship Result 2017 has been published today 7th June 2017. DBBL SSC scholarship application had been started from 7th May and the application ended on 5th June 2017. In this year those students who got GPA at least 4.83 from rural and undeveloped area they can apply for the Dutch Bangla Bank SSC Scholarship 2017. But for the students of city corporation area’s school and district town area’s school and institute they need to have GPA 5.00 to apply for the scholarship. Click the red link GET PRIMARY RESULT to get the primary selction result of DBBL sholarship 2017. The result will be given at DBBL website. The result has not found yet after getting primary selection result you can download from the link easily. So to get it keep waiting and keep eyes on our page. We are working to get the result after publishing we will upload it here immediately. We are very sorry to say that the online result link has been disappeared still now but they have announced their first result via SMS on their given mobile number. Those are selected they have been known by sending a SMS that they have been selected for the primary selection result. So those have been selected they have already got the confirmation messege from the DBBL Authority. Students need to be passed in 2017 from any Education Board. GPA at least 4.83 from rural and undeveloped area. GPA at least 5.00 from City corporation and district town school. GPA will be counted without 4 subject. Application Starts on 7th May 2017. Application Ends on 5th June 2017. Result will be published on 7th June 2017. Students will get the benefits for the period of 2 years. Monthly Scholarship Bonus 2000 TK. Text Book Purpose 2500 tk will be given annually. Uniform purpose 1000 TK will be given annually. To apply students need to visit the official website of DBBL and submit with the all required information. They have to attached passport size photo and the scan copy of the mark sheet of result 2017. To apply click here Apply Online and submit with all information. Hope for the best for those applicants. Note: They won’t be allowed for the scholarship those get from any other scholarship without government scholarship. The official circular of DBBL has been given as JPG at the top. read the notice carefully and apply for the scholarship. To get such a useful notice stay with our page regularly at bdresultpage.com and follow our official Facebook page at www.facebook.com/Bdresultpage and stay blessed.